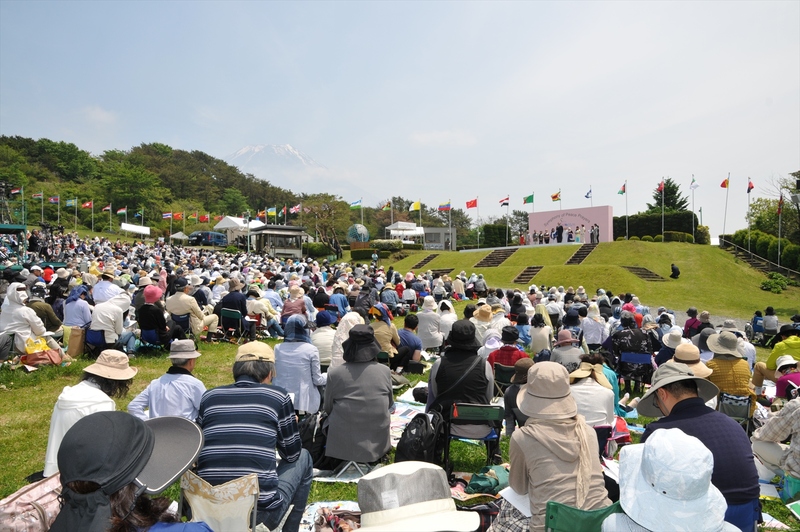 Sunday dawned bright and crisp at Fuji Sanctuary, as thousands gathered for the annual Symphony of Peace Prayers. 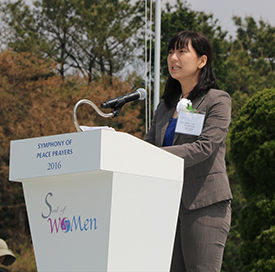 This event would be special – not only would there be prayers from diverse faith traditions, special music and a grand World Peace Prayer Ceremony with the flags of all nations, but also an inaugural celebration of the Soul of WoMen campaign joined by 17,474 participants from 109 countries hosting 158 events in 1007 cities on the same day. Mr. Tomohiko Naya, President of Byakko Shinko Kai, entered the Ceremonial Field to address close to 10,000 people gathered in the spring sunlight. 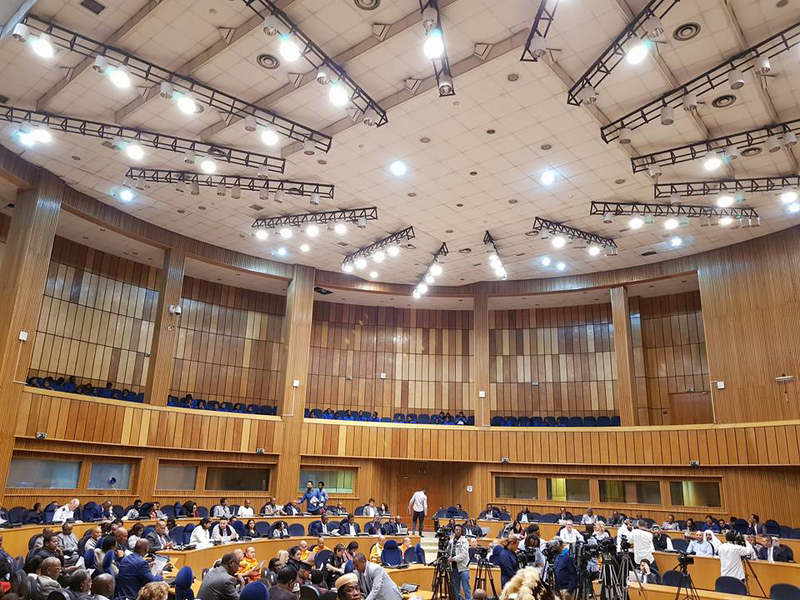 He introduced the Symphony of Peace Prayers, with its heart-based intention to express the oneness of humanity, and explained the theme of the day, the Soul of WoMen Campaign. 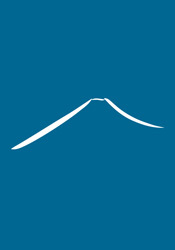 Around the world, people watched the live webcast, beautifully hosted by Fumi Johns Stewart. Mr. Naya introduced Masami Saionji, resplendent in her lovely kimono as she thanked all those in Japan and around the world, who had helped to support and expand the Symphony of Peace Prayers. 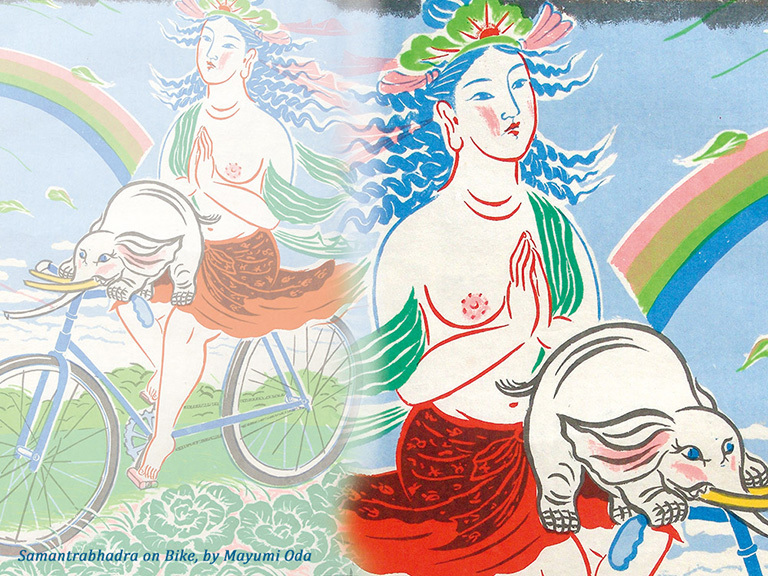 Mrs. Saionji stressed our unity at the source, and the role of spiritual women in opening the door to realizing the Divine Spark in all humanity. 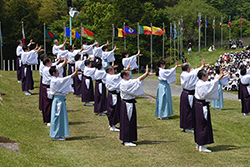 There followed a deeply touching prayer in movement by members of Byakko Shinko Kai in graceful coordination. Then representatives of diverse faiths – Islam, Catholicism, Judaism, Shintoism, Buddhism, Sikkhism, and Hinduism – took the stage alongside Masami Saionji to offer prayers for peace. 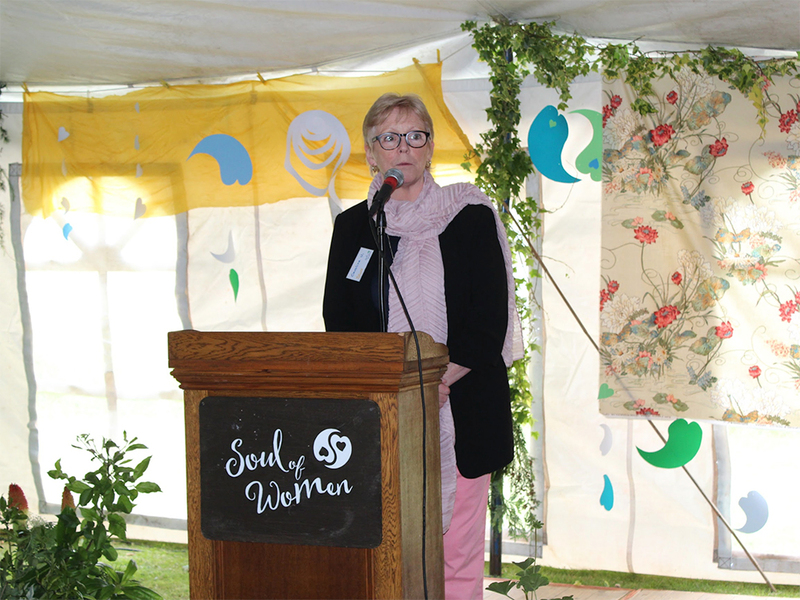 Then it was time to celebrate the Soul of WoMen campaign. Hiroo Saionji, President of the Goi Peace Foundation, spoke about the network meeting in Tokyo. 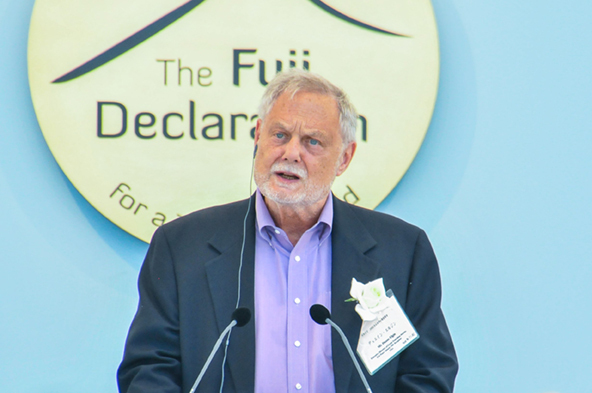 He gave some background on the Fuji Declaration, mentioning the outward masculine energy that has been important in our world, and how the feminine is now needed to strike a balance. 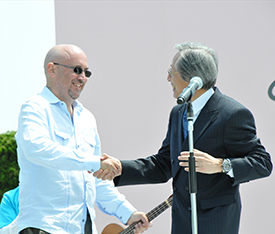 Mr. Saionji personally introduced the international guests one by one, and each offered a brief but inspiring message for the day. 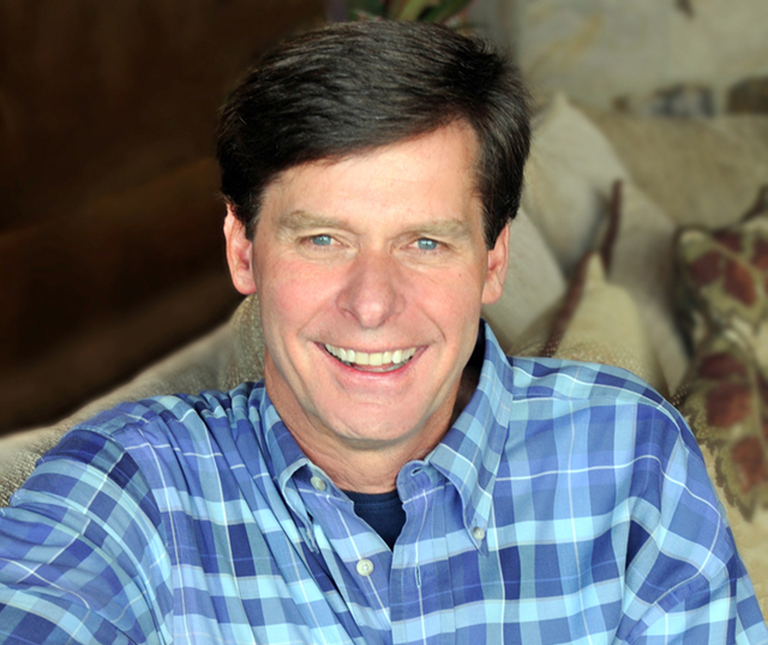 At 12 noon, James Twyman spoke about the power of the love that unites us all. He then invited everyone present to join thousands all over the world who had registered to take a minute of silent meditation to hold the perfect divine balance between the feminine and the masculine. Mr. Twyman performed his original song, “May Peace Prevail on Earth,” followed by the song “We Are All Shining Divine Sparks,” which was introduced at the 2015 Symphony of Peace Prayers. Mrs. Saionji thanked James, expressing her conviction that the power of prayer is the strongest way to unite all the people of the world. 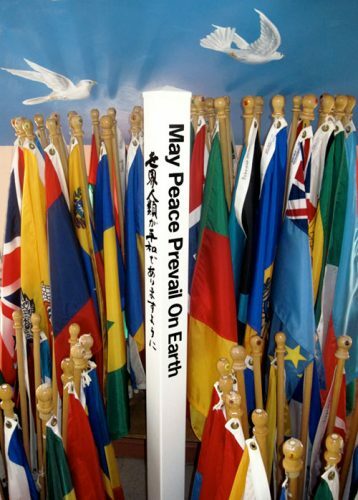 The flags of the world were then paraded onto the field in a spectacular pageant of peace. 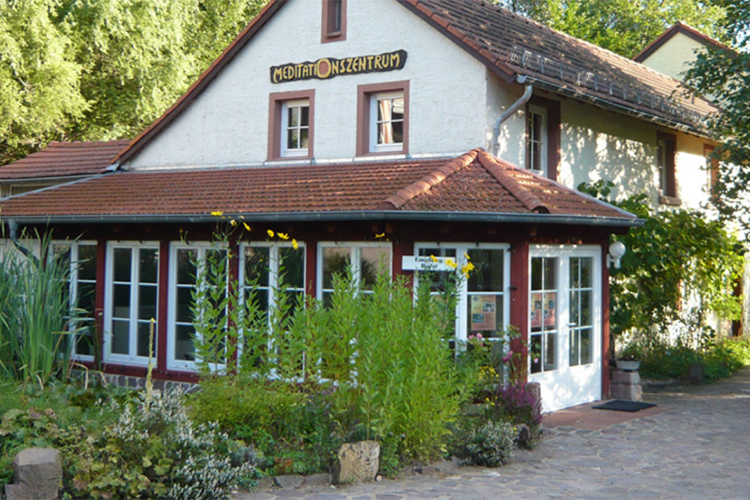 Everyone gathered there prayed for each country in its own national language(s). All was in perfect unity: the flags of all nations, the prayers of the people, and all hearts as one in the sparkling sunshine. 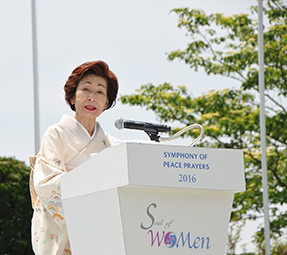 As Byakko Deputy Chairperson Yuka Saionji offered her heartfelt closing remarks, the loving spirit of the event filled the Prayer Field and beyond, opening the gateway to a future where the Soul of WoMen rises to bring our world into balance, harmony and peace. Now it is up to all of us.